Having grown up in Brooklyn I’ve always been fascinated by gangsters. Whether it was reading about how Lepke Buckhalter operated Murder, Incorporated in my old neighborhood or watching Tony Soprano and his pals eat some mouth watering Italian food I was intrigued. The June 28 attack on the former Intercontinental Hotel in Kabul was a kinetic attack that sent some very clear messages. 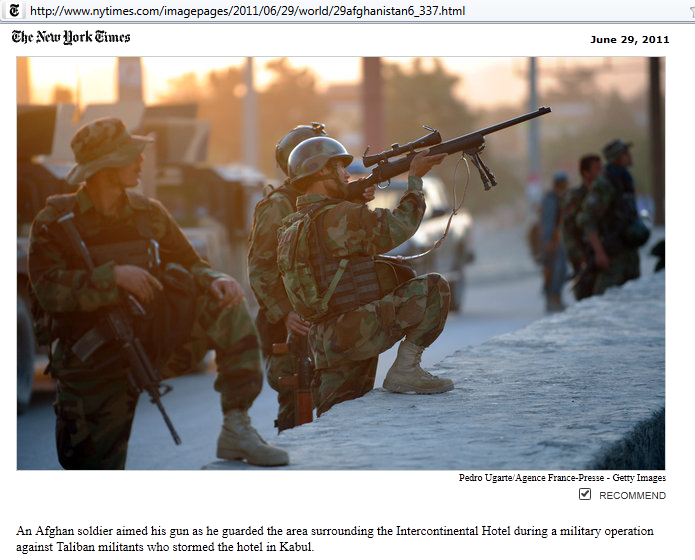 (See the June 28, 2011 NY Times at @http://www.nytimes.com/2011/06/29/world/asia/29afghanistan.html?_r=1) Photo Source is the NY Times. First of all, the target was purely Afghan. There were no Coalition forces present and the hotel is no longer the Mecca for foreign visitors that it once was. Secondly this was perhaps a Goldilocks target – not too soft like a market, and not too hard like a NATO base. Thirdly the tactics were pure light infantry and coordinated in the face of what appears to be reasonable security measures. From an IO standpoint it was a much better rebuttal statement to President Obama’s speech (see previous posting) than the Republicans could hope to accomplish. An old maxim of criminal jury trials is that the prosecutor has to convince all the jurors of innocence while the defense attorney has to convince just one. Or as we used to say “One aw sh*t wipes out 100 attaboys”. The good guys need to be lucky all the time and the bad guys only need to be lucky once. Is the attack a game changer that will change the President’s mind or cause the incoming ISAF Commander to revise the strategy and concept of operations? Probably not. It does however; show that the enemy fully understands how to execute kinetic operations for psychological effect. It means that the Coalition must step up influence operations to serve as a catalyst to build resilience in the Afghan people so that they can accept occasional setbacks and successes by the enemy and emerge stronger and more resolved as a result of them. At 2000 hours Eastern time on 22 June President Obama announced his plans to withdraw troops from Afghanistan (speech at: http://www.whitehouse.gov/the-press-office/2011/06/22/remarks-president-way-forward-afghanistan). The ISAF Website indicated that the US had 90,000 troops in country. (Source: http://www.isaf.nato.int/troop-numbers-and-contributions/united-states/index.php). 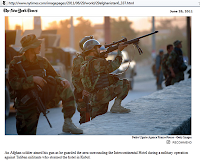 On June 23, 2011 Stratfor, often called the private CIA published its analysis (http://www.stratfor.com/weekly/20110622-obamas-afghanistan-plan-realities-withdrawal?utm_source=SWeekly&utm_medium=email&utm_campaign=110623&utm_content=readmore&elq=0cef78dfc87745459b50e62cd1bb2eb8). Information engagement on any front in Afghanistan is hard, the job just got harder. One of the durable key messages from the War is “NATO is here to help Afghanistan help itself.” For 10 years the progress has been glacial and there doesn’t seem to be any indication that the Afghani people seem any more anxious to change their world. The Stratfor article rightly points out the security and logistical challenges the draw down will have to face. The Taliban have been used to waiting for foreign troops to leave – ask the Russians. The security equation hasn’t seemed to be altered very much either. The less US troops the better the odds for the enemy unless the Afghani people can get off the dime. The Taliban have proven their marketing acumen, the no doubt will help spread the news that NATO is pulling out. The fact that the 2014 deadline given by President Obama may not be his problem at the time in the unlikely event he doesn’t get re-elected, or he can simply change his mind because he won’t be running for re-election. As the shadow of American security pulls back from the country side and into the city the vacuum will no doubt be exploited by the Taliban. Frankly I ‘m not sure what kind of information engagement can compete with reality on the ground. This is the first time that I’ve covered three topics in one posting – sometimes you just gotta do what you gotta do. The Committee directed the Assistant Secretary of Defense for Special Operations, Low Intensity Conflict and Interdependent Capabilities in coordination with CDR, USSOCOM to provide a report outlining a comprehensive MISO strategy to include roles, etc. for MISO and Active Reserve Components. The Committee members are listed at: http://armedservices.house.gov/index.cfm/emerging-threats-and-capabilities. If you are represented by any of them, I urge you to contact them via e-mail and let your voice be heard. When the Report is presented – let’s hope it becomes available to the public. I’m not going to recap what is in the article. Rather this is a classic example of how Computer Network Operations (CNO) must work hand and hand with influence operations. It also shows how the lines between strategic (national) resource and tactical (localized) deployment are blurring. The technical capability is all well and good, but capitalizing on it is another matter. Normally this requires content and lots of it. Credible content in the local language is the heart of any influence campaign. Hopefully the Department of State is working with DOD in most cases since DOD forces are on the ground. I would also expect that many Military Information Support Teams (MIST) would be involved as liaisons and information conduits when necessary and appropriate. This kind of integration of CNO and MISO must be as much a part of our training and doctrine as marksmanship and PT. Ultimately perhaps there will be regional packages that will facilitate regional communication such as would be applicable in village oriented AOs like Afghanistan. The article discusses current successes and failures with a variety of media from short wave to Twitter. It points out that not many Americans (including me) didn’t know that the VOA reaches 100 countries in 59 languages. More well known efforts include the classic Radio Free Europe and Radio/TV Marti. There are also relative new comers like Alhurra set up to be an Al Jazeera knock off. Some key points for MISO: some old technologies are still good ones in selected targeted areas, and staunch governments like the PRC employ stringent technological means to control what media their citizens can get. 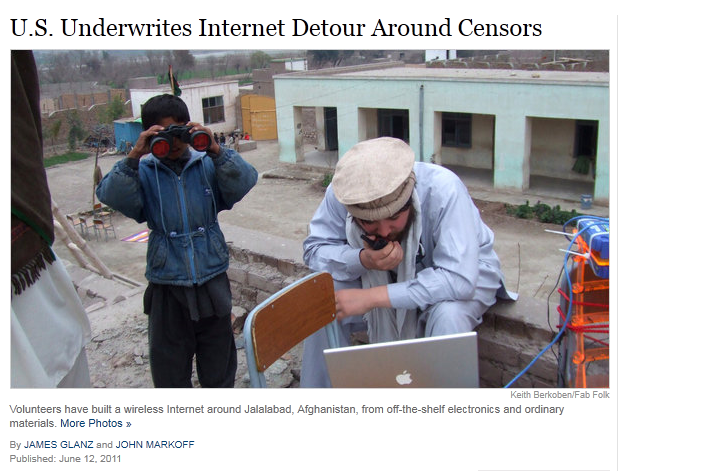 The Chinese move from radio to the Internet has been especially perplexing to VOA. National level MISO resources, which are likely SOCOM or 4th MISG centric at the moment are not the exclusive property of those units. Rather they are as much a part of the DOD arsenal as MREs. The SOCOM chain of command needs to insure that their RC brothers and sisters are aware of the resources and trained on them so that combatant commanders are able to exploit all their options. Frankly if Congress, with an overall lack of military expertise is concerned about inequalities of capabilities, how in the hell should we in the community feel? I spend quite a bit of time in rural Idaho. It isn’t Afghanistan, but it ain’t Brooklyn either. There is a new wind farm project being built on the outskirts of town. As I understand it there are 63 windmills being built to convert wind power into electric power. An unknown number of local farmers have leased the land to the developer. The ‘locals’, at least those who haven’t made any money by leasing their land, are not happy. They are generally not in favor of new things or new ways and there is a lot of uncertainty surrounding the ultimate effects of the wind farm. For one thing there will be windmills and not a few of the sky, for another there is a great deal of angst about the potential effect on crops and animals. The developer built a network of wide dirt roads on private property – part of the land leases. The local newspaper ran some stories explaining that this was all on private land and that the county had not closed any roads. Yesterday I’m picking up my lawn mower and there’s a couple ahead of me talking to the proprietor of the mower repair shop. All parties agree that the county has been reached by the developers to close roads and that something evil must be taking place because they can’t seem to figure out a way to ‘get up there and see what’s going on’. I’m willing to bet that this is a scenario NATO forces are seeing in Afghanistan every day. It’s hard to convey information that people don’t want to hear. Making matters worse is that the most credible spokespeople for the project, the farmers/ranchers that have leased their land, are hesitant to come forward and admit that they are actually making money from the project, perhaps for fear of being looked upon as traitors. Bottom line: Credible rural messaging requires respected local spokes people. and referrals to attorneys for military personnel and their families. Three US DOD contractors reported being ‘hacked’ through the use of cloned RSA SecureID access control vectors. The L3 and Northrup Grumman attacks were reported in early June 2011 and the Lockheed Martin attack reported in late May 2011. The almost too easy conclusion to jump to is that US DOD contractors and other critical infrastructure targets were the motivation behind the March 2011 attack against RSA, the security division of EMC. The hack was reported on by a number of publications (e.g. Wired http://www.wired.com/threatlevel/2011/03/rsa-hacked/). For those among my readers who are interested in the cyber side here’s some additional background. While the attacker, no doubt was a well funded and disciplined nation state motivated by the information they would gather, From a cyber perspective this is a great example of combining Computer Network Exploitation (CNE) and Computer Network Attack (CNA). However – I’d like to explore the psychological aspects of the attack which, if my theory about the attacker is correct, I’m sure is still smiling about the unseen and perhaps emotional impact felt by the victims. I compare these cyber attacks to having your home burgled and person possessions stolen. There is an irrational and emotional sense of personal violation even though the crime itself is non-violent and material possessions can always be replaced. No doubt the contractors placed their confidence in the RSA commercial product figuring that it would afford them a comfortable level of protection. They probably never anticipated that anyone would attack the vendor and then exploit them and so there is the same feeling as being robbed in spite of having a burglar alarm and a large dog. While NSA and the Cyber Command are not likely to comment publicly even if they ‘know’ the source of the attack, DOD and the Contractors are now on notice that their bedrooms have been robbed and their jewelry is gone. This is powerful psychological stuff and should be recognized as such. This latest episode is the clearest evidence yet of the need to combine PSYOP with cyber regardless of the command ‘rice bowl’ issues and the veil surrounding our cyber efforts. SWC needs to insure that PSYOP curriculums feature enough practical CNE, CNA and Command Network Defense (CND) so that our influence warriors can dominate the cyber information battlespace as well as our conventional domains.